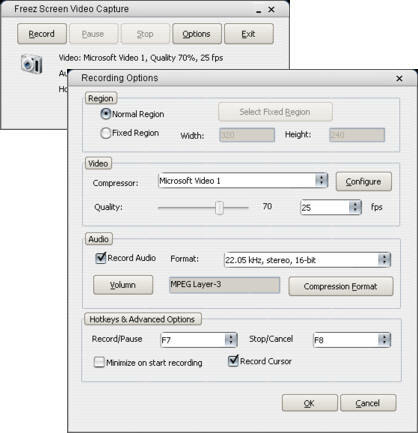 Freez Screen Video Capture is a screen-capture & screen-recording tool to record screen activities and sounds into standard AVI video files. You can record any part of the screen’s activities and the cursor’s movements, using a microphone to narrate your screen recordings. You can choose the output video’s compressor (such as Microsoft Video 1, MPEG-4, DivX…), quality, framerate, audio format (such as PCM, ADPCM, MP3, OGG…), and volumn. You can also start, pause, and stop screen recording with hotkeys. This entry was posted on Sunday, May 13th, 2007 at 2:37 pm and is filed under Authoring Tools. You can follow any responses to this entry through the RSS 2.0 feed. You can leave a response, or trackback from your own site. Freez video capture is NOT free. They pretend they are, but after a certain amount of time (7 days, in my case), they forced me to register “for free” to continue using the software. After you register, you discover that they can’t actually give you a free registration code due to “high traffic”. You are given the option to buy the software for $25. Many reviews of this software on download.com will attest to this fact. It appears that their other products use the same model because I noticed that the “free” button for those products were also grayed-out on their registration page. It’s a pretty scummy business model, and I refuse to buy their software out of principle and after being deceived by them. Speaking of which, a quick look around download.com reveals another screen-capture product which is marketed under a different product name and different company name – but the screenshot is identical to the Freez product. It appears that they are trying to sell the same product under several different names to trap as many users as possible. Right now, I’m trying CamStudio – which appears to actually be free, and it’s open source (I verified it’s existence on sourceforce).